The black NASCAR truck with a white “54” on the side gleamed on pit road as its driver walked up for the night’s race, prompting three dozen photographers and well-wishers to edge closer. Indeed they are — especially the executives who run NASCAR — because Wallace is an African American. Despite NASCAR’s growth into one of the nation’s most popular sports and a driver-diversity effort now in its 10th year, stock-car racing lacks a full-time black driver at its top levels. No African American drives in NASCAR’s premier Sprint Cup racing series — where such stars as Dale Earnhardt Jr. and Jeff Gordon compete —and there isn’t a full-time black driver in its second-highest level, the Nationwide Series. Wallace, who is a rookie driving in NASCAR’s third-highest series, the truck-racing circuit, appears to be the sport’s best black hope to make it to the top. “If he wins his share of races, does really well, he’ll get an opportunity,” NASCAR Chairman Brian France said of Wallace. Having a black driver among the 43 who race each weekend in the Cup series “is coming but it can’t come fast enough,” France added. 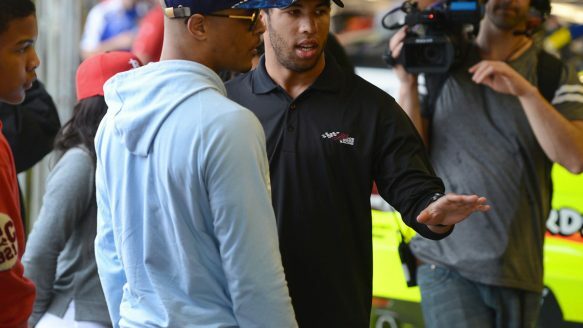 JEFF SINER / MCT——NASCAR Camping World Truck Series driver Darrell Wallace Jr. shows hip hop artist T.I., (left) around at Daytona International Speedway in Daytona Beach, Florida. He grew up in Concord, N.C., near Charlotte where most NASCAR teams are based. Wallace got the racing bug at age 9 after driving a go-kart. Soon after, he was driving small race cars with 30-horsepower engines, called “bandoleros,” and quickly showed a knack for beating others to the finish line. He won 35 of 48 races. By his mid-teens, Wallace had the look of a racing prodigy when he joined one of NASCAR’s minor league circuits, the K&N Pro Series East. He won six races over three seasons and was named rookie of the year in 2010. Last year, Wallace drove in four of NASCAR’s Nationwide Series races and finished in the top 10 three times, including a seventh-place finish in Iowa, ahead of Danica Patrick and Kurt Busch. Wallace showed enough talent for Joe Gibbs Racing, a top-flight NASCAR team, to put him in the NASCAR Camping World Truck Series this season, featuring highly modified pickup trucks. In February at Daytona in his Truck Series debut, Wallace escaped a crash and finished 12th in the race. “Made a mistake early. Learned. Capitalized. Missed the big one. Finished p12. Survived Daytona. That’s a good weekend,” Wallace tweeted his followers. His next race is Sunday at Rockingham, N.C.
To move up to NASCAR’s elite Cup series, however, Wallace not only has to keep racing well, he must attract the corporate sponsors that are essential to cover the costs of NASCAR’s multimillion-dollar teams. That’s a tough challenge for any young driver. “It’s not black or white, it’s green, that’s the bottom line,” said Brad Daugherty, an African American co-owner of a NASCAR team and a NASCAR analyst on ESPN. If Wallace does make it, he would integrate the driving ranks of a sport that remains overwhelmingly white 65 years after NASCAR was formed and help widen its audience as stock-car racing’s popularity has flattened. NASCAR was formed in the South and largely remained a regional sport for its first four decades. Its early stars, such as Richard Petty and Bobby Allison, were Southerners and most of the race tracks were south of the Mason-Dixon Line. One African American driver, the late Wendell Scott, won a race in 1963 in the equivalent of what is now the Cup series. But Scott battled racism throughout a career that ended in 1973. He was barred from some events and even his 1963 win, in Jacksonville, Fla., wasn’t acknowledged by officials until well after the race ended. By the late-1990s, when Tiger Woods was becoming the first black star in golf, NASCAR was expanding across the nation. New tracks appeared in Las Vegas, Kansas, Chicago and Texas, with the sport developing a broader geographic reach as its popularity soared. Most of its current star drivers — including Gordon, Kyle Busch and reigning Cup champion Brad Keselowski — grew up outside the South. Even so, NASCAR remained slow to integrate. Drivers and their pit crews remain mostly white males and, as the grandstands plainly show, it’s primarily white fans who attend NASCAR races. Danica Patrick made headlines this year by becoming the first woman to win the pole position at the Daytona 500. And two Latinos — Colombian Juan Pablo Montoya and Cuban-American Aric Almirola — also are full-time Cup drivers. But there have been only a handful of blacks among the 2,866 drivers who have competed in the history of NASCAR’s Cup series. NASCAR realized its lack of diversity was a problem. So in 2004 the organization started its “Drive for Diversity” program to promote minorities and women. The program picks several drivers each year to race in NASCAR’s lower levels for a team called Rev Racing that’s mostly funded by NASCAR. Wallace, who’s nicknamed Bubba, is one of the program’s top graduates. He also had substantial help before that from his father, the owner of an industrial cleaning business, who estimated he’s spent about $1 million on his son’s career. When his son started racing in the minors, the elder Wallace bought race cars plus premium engine bearings, tires and other costly parts. There also were hefty transportation costs as Wallace Jr. raced three or four times a week, often in different states. “As he moved up it just got more and more expensive,” Wallace Sr. said. At one point “I had to borrow money to pay the employees at work” to have the cash for his son’s career. The Gibbs team had started its own NASCAR diversity effort a decade ago with NFL Hall of Famer Reggie White, who said at the time, “Maybe we’ll find the next Tiger Woods in NASCAR.” Although White died in 2004, Gibbs kept looking for minority drivers with talent. But Wallace signed with Gibbs just as the economy was tanking and “their sponsors were cutting their funding, so we were able to go to the Drive for Diversity program and spend two years with them,” Wallace Sr. said, though his son stayed attached to Gibbs’ team as well. Last fall there was speculation Gibbs might put Wallace into a full-time Nationwide ride this year. But J.D. Gibbs said the team didn’t have enough sponsorship for a full season on that circuit, so they opted to put Wallace in the less expensive, 22-race truck series. Even that’s not cheap. A NASCAR truck team costs $2 million or more to operate each year; a Nationwide team can cost $5 million or more and a top-flight Cup team costs upwards of $20 million. And since the economy collapsed in 2008, selling those corporate sponsorships has been much tougher. “Every rookie driver is having a hard time finding somebody to take a chance on them,” France said. Toyota and Coca-Cola are among Wallace’s truck sponsors. Wallace, who has a polite self-assuredness, knows the pressure is on him to race well this year if he hopes to lure the added corporate backing that eventually would place him alongside Earnhardt, Gordon and the others in NASCAR’s major leagues.